Three variants of Vivo NEX phones namely NEX, NEX S and NEX A were recently certified by 3C body in China. Rumors have it that one of the could be driven by Snapdragon 710 chipset and there will be higher model featuring Snapdragon 845 SoC. To clear some confusion, the Vivo NEX S smartphone has appeared on Geekbench benchmarking platform today. The listing confirms that the NEX S will be a flagship variant. 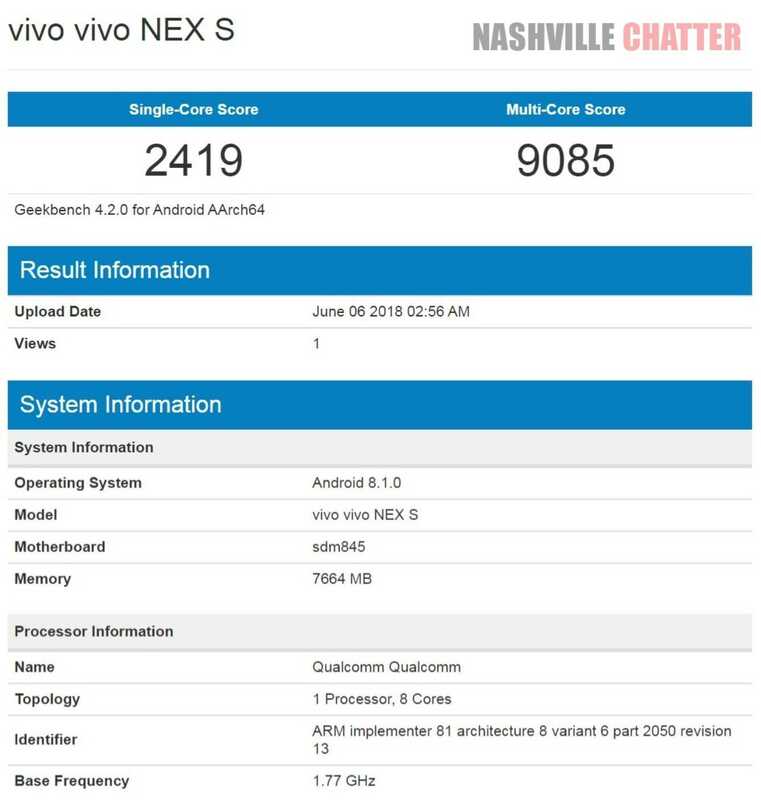 According to Geekbench listing of the Vivo NEX S, the handset is preinstalled with Android 8.1.0 Oreo and is fueled by Snapdragon 845 chipset and 8 GB of RAM. In single-core and multi-core tests on Geekbench, the Vivo NEX S has respectively scored 2419 and 9085 points and this multi-core score is the highest among any Vivo phone released so far. The Geekbench appearance of Vivo NEX S seems to be a sufficient proof to confirm that it will be a flagship variant. What about the other variant that is dubbed as NEX A? It could be a lower variant featuring the Snapdragon 710 chipset. 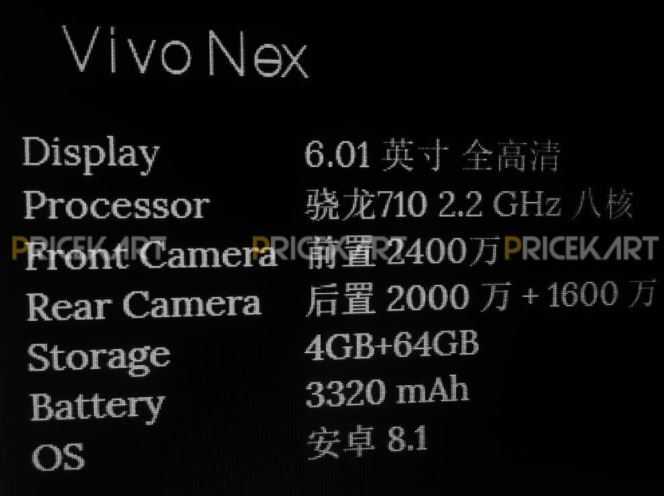 A leaked image that had surfaced yesterday had revealed that the SD710 edition of Vivo NEX features 6.01-inch FHD+ display, 20-megapixel front camera, 20-megapixel + 16-megapixel dual camera setup, 3,320mAh battery, Android 8.1 Oreo, 4 GB of RAM and 64 GB of native storage. Fresh set of photos that show promo material of Vivo NEX have surfaced today. The images reveal that the Vivo NEX phone has a huge 6.59-inch display, pop-up selfie camera, 6 GB of RAM, 128 GB of storage and 4,000mAh battery. There is no information available on the chipset that will be driving the phone. This variant may arrive with Vivo NEX moniker. Like the above, the Vivo NEX S with Snapdragon 845 and 8 GB of RAM may feature a 6.59-inch display. Also, it may also come with a larger inbuilt storage of 256 GB.